The Order, a mysterious and powerful organization, has infiltrated the U.S. government at the highest levels, bent on remaking humanity in its image. Deep in their underground genetics facility, they’ve created a new race of enhanced humans, among other deadly creations. As an infant, Erica escaped the facility, but will she ever be able to escape her fate? In hiding for over 15 years, she’s been hunted. Her desire, to live free and in peace. Now the world has changed. A viral outbreak manufactured by The Order, human apex predators roam freely, humanity has bound together in pockets of resistance. The children of The Order have turned on their masters in a race for supremacy; spread out across the country, systematically taking over key military installations. Though not entirely human, Erica may hold the key to humanity’s survival. Will she run, as she always has? Will she stand, one against many and risk losing all she holds dear – Her freedom, her family, her very existence? 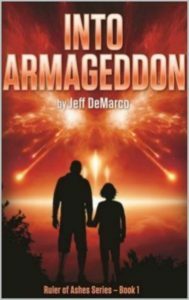 Into Armageddon is the beginning of a dystopian post apocalyptic world, includes elements of Military Fiction, Science Fiction, hard science and genetic engineering, but reads like an action/ adventure and romance all wrapped up into one pulse pounding novel that you won’t want to put down. It’s the first book in the Ruler of Ashes series. But there’s an evolution to all sides, over the course of almost two decades. This story is an exemplification of love, growth, life, and sci-fi action that’ll have your favorite chair ready for the junkyard. Get ready to squeeze those armrests. I’m not joking. 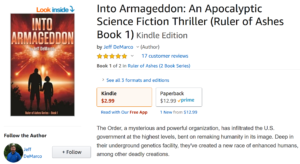 And it’s early to say but I’ll go out on a solid limb: Into Armageddon, by author Jeff DeMarco, will be added onto my favorite’s list, for the year of 2019. This was an explosive, diverse, everywhere adventure that reminds me of only one other book. But the only thing it had in common with that other work—and no names here because I want this 5-star review to fully illuminate Jeff’s unique style and amazing talent for storytelling—was how Jeff’s story will stick with me for a long time to come. I absolutely LOVED this book. After cleverly thought-out and close-call getaways—and the aforementioned sacrifices, with deep character development continuing throughout the story—a special child survives, against the odds. She’s a beautiful young girl, smaller than most, and one to fall in love with. But there are ten more genetically modified special ones who sit on the fence, wavering this way and that—save for one. One of them is a dark soul with no chance to see “the light,” a black heart, yet very smart, very powerful, with extraordinary capabilities. And this dark one has decided. And because of this decision things go awry for the entire world. SNAP! Fast-paced like the story is, this happens quickly. From part two, mid-book, it’s all up to a group of survivors—who’d found each other because of some very special reasons—to lead the resultant chaos, and remaining lazy human beings, back toward a life with some structure. From their destination on the military base, everything culminates and builds. And the escalation resulted in me finding myself cheering, nearly roaring out a “YES!” and pulling a few fists of schadenfreude—as well as tearing up. And, a first in a long time, I found myself glancing at the ‘percent-finished’ indicator at the bottom of my Kindle app. I’d hoped this story would never end. But it did. And when it did it was as though I was hopped up on bennies for two hours! The climax of events was a culmination of genetically modified terrors brawling with omnipotent powers. CLASH! And combined with the characters I’d come to love—all of it was just too much. But all ended well, almost. Stage SET for the sequel! And I am all in! SIX out of FIVE stars for Into Armageddon. It was THAT freakin’ AWESOME!